1 Preheat oven to 200°C, 180°C fan, Gas Mark 6. 2 Place vegetables including garlic in a roasting tin, drizzle with the vegetable oil and roast in oven for 30-40 minutes until nicely coloured and soft. Leave to cool. 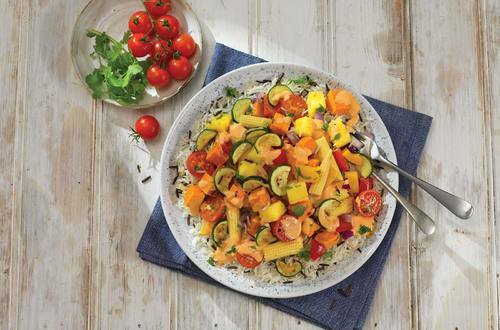 3 Tip the cooked rice into a large mixing bowl and add the roasted vegetables. Top with the cooled corn, pineapple and tomatoes. 4 Pour over Hellmann’s Thousand Island Dressing, add the chopped parsley. 5 Toss well and serve.